ENO Atlas Hammock Suspension System. Atlas was powerful enough to shoulder the weight of the world. Inspired by the legendary Titan, ENO created the Atlas Hammock Suspension System. 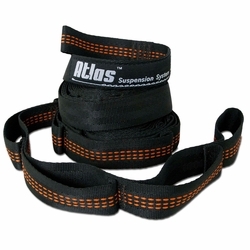 Agile but enduring, the Atlas Strap weighs a scant eleven ounces, yet boasts a whopping thirty combined adjustment points. Constructed from Poly-Filament webbing with overlapping attachment whorls, the Atlas Strap is the ultimate in hammock suspension. When the weight of your world becomes too much to bear, hop in an ENO and trust all your cares to Atlas. Eagles Nest Outfitters. NOTE: STITCHING COLOR MAY VARY.